I’m feelin’ pretty reflective these days. 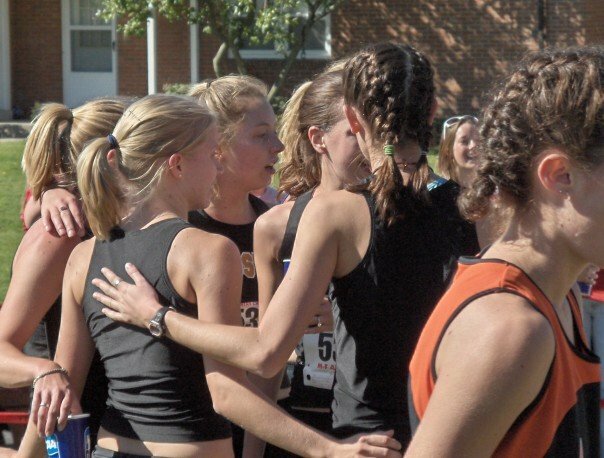 Reminiscin’ the good ol’ college XC racing days. I ran for an amazing D3 Liberal Arts College in Ohio and I loved every aspect of it. (edited to note: amazing, as in the school was amazing/awesome/perfect for me. I’m not trying to brag about how amazing our team was. But well, now that we’re talking about it… we were kinda a big deal. Haha. Jk. But seriously). I loved my team, my coach, our home course (side note: it was insanely hilly; we had a hill infamously called “The Big Kahuna”). Back in those days (that makes me sound/feel old), I had this dinky little clunker of a 3-megapixel camera and it makes me sad, because so much of our XC and track days went undocumented. I wish I had more photos. But looking through the few photos I have, I can feel the spikes on my feet and the pounding of my heart and the sound of the spectators screaming away. And it fires me up for Boston. Who else ran XC in HS and/or college? I found your blog through Courtney (cisforcourtney) and just recently started reading. Love this post, I definitely miss the whole experience of hs/college cross country. I also saw that you ran for Wooster? My boyfriend actually graduated from there in ’07, small world. I ran my senior year of high school and was part of the first ever girl’s team at the school (kinda cool). Never won anything, but managed to get myself lost on our home course – which explains why I never run trails alone. It’s just not feasible for someone born without an internal compass!!! I ran cross country in high school – you have more photos than I do! That last leg photo is actually pretty awesome! I’ve been toying with the idea of running a trail race….this kind of makes me want to run trails even more! I have so many amazing memories from cross country in high school, too. It was during those years that I fell in love with running for life. Priceless!